Extending the principle, there is no question that "e-book" (and also "Ebook" and "eBook") will go out of style shortly. The only real question is if "ebook" will stick or if we will end up on just "book". It's instructive to note that if someone tells me to mail them a document, I will reach for my computer and not for a paper envelope. Both are interchangeable, so you can use the hyphen-version as well as the non-hyphen version. There seems to be no general consensus. Both are apparently valid. Personally, I would go for the version without the hyphen as that's easier to spell and remember. Trust me, I've got a website named like my nickname and sometimes, that hyphen is killing people. Thinking about it, I could imagine StackExchange came to a similar conclusion when dropping the hyphen. Yet, that doesn't mean I would like to see edits by spelling-nazis who rant and rave on every hyphen they see. I would simply make both interchangeable, with the hyphen-version being treated as a synonym. Dailywritingtips.com wrote a related article and they also did a related poll, but that was 4 years ago. Google1 has 499 million results for ebook/eBook, versus only 138 million for e-book/e-Book, 3.8 million for digital book, and 24.5 million for e-edition (most of which appear to be newspapers). 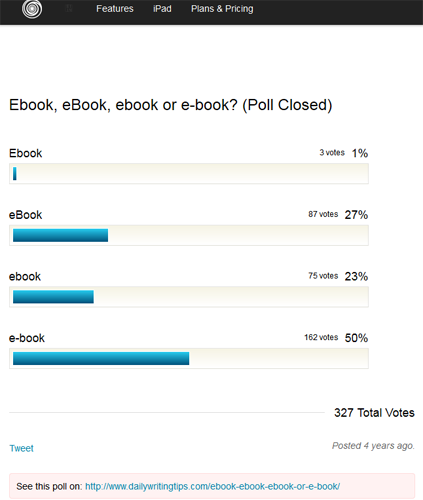 So, at least according to Google, ebook/eBook pretty clearly wins. 1 All searches done with exclusion operators (e.g. "ebook" -"e-book") to stop Google from auto-guessing equivalent words. How do I ensure my Hebrew displays correctly in the Kindle apps and EPUB readers? Is it necessary/possible to specifically target foreign-language “editions” of amazon?